On May 16th, 2013 the Greek Section had its 8th technical meeting for the 2012-2013 season. In the presence of a good audience of 38 members and 10 non-members Dr. George Zaraphonitis, Associate Professor at the School of Naval Architecture and Marine Engineering-Ship Design Laboratory of the National Technical University of Athens (NTUA), Greece presented the above topic. The new probabilistic damaged stability regulations for dry cargo and passenger ships (SOLAS 2009), is admittedly a major step towards the rationalization of the procedure for the assessment of ship’s survivability in damaged condition. There are, however, serious concerns regarding certain aspects of this regulation, and in particular its impact on the level of safety of RoPax and large passenger ships. The spectacular COSTA CONCORDIA accident reiterated these concerns. A 3.0 Mil. Euro, EU-funded research project named GOALDS (Goal Based Damage Stability), coordinated by the Ship Design Laboratory of NTUA, was launched in 2009 to derive a new damaged stability formulation for passenger ships and to propose new risk-based damage stability requirements. The project ended in October 2012 and led to a submission of main project results to IMO-SLF55 (Jan. 2013). The main objective of this presentation was the investigation of the impact of the GOALDS formulation on the design and operational characteristics of characteristic RoPax and Cruise ships. To this end, an integrated, multi-objective design optimization procedure of NTUA-SDL encompassing the parametric design and optimization of passenger vessels was adapted to the new damage stability formulation and applied to the formal optimization of selected sample vessels. The presenter showed the results for two typical passenger ship designs (a medium size RoPax and a Panamax Cruise ship), which were redesigned and optimized in order to study the feasibility of the new survival factor and risk-based requirement formulation. It proved that the survival level of passenger ships can be significantly increased cost-effectively. Main discussion points were the acceptance of the proposed enhanced survivability requirements by the industry in relation to the developed new CAF (Cost for Averting Fatalities) criterion, standing now at 7.45 Mil. US $. It should be noted that a more comprehensive paper on the same subject is planned for presentation by the GOALDS consortium at the SNAME 2013 AM (Nov. 2013). The meeting was concluded with the traditional reception of the local section in an adjacent hall in the MARAN Tankers Management building. 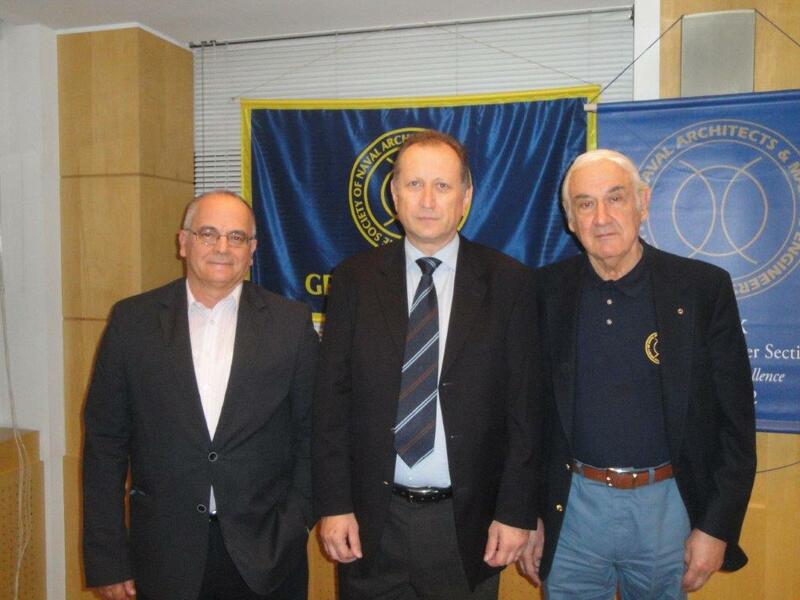 ( from L to R ): A. Papanikolaou, Chairman; G. Zaraphonitis, Author; P. Lalangas, Secretary / Treasurer.